If your recording and playback needs are very simple, the T4 is a stunning performer. Sounds great. Good for those with simple setups. LEDs aren't that useful. Needs a separate headphone volume control. 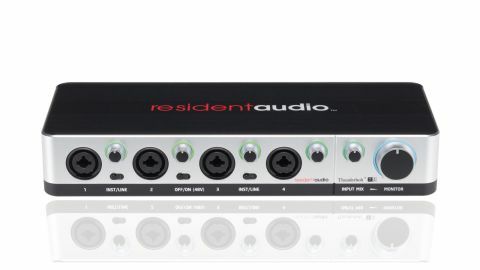 A 4-in/4-out bus-powered Thunderbolt audio interface for Mac and PC, the T4 is a fairly hefty unit with four combo XLR / 1/4" inputs, a 1/4" headphone output, four balanced 1/4" jack outputs (one doubling as a second headphone out) and MIDI I/O. "It operates at up to 24-bit/96kHz and sounds truly fantastic"
Each input has its own gain knob, phantom power is an option, and the Input Mix knob blends the input signal with the output from the host computer. It operates at up to 24-bit/96kHz and sounds truly fantastic. Connecting via Thunderbolt, latency goes down to 1.5ms with no loss of stability until the system is really pushed. There are some issues, though. The LED collar input indicators are weirdly insensitive, limiting their usefulness; but more problematic, the headphone level can't be adjusted independently of the main outs (seriously!) and the software provides nothing in the way of signal routing options. If your recording and playback needs are very simple, the T4 is a stunning performer. For more elaborate setups, however, the lack of flexibility lets it down.